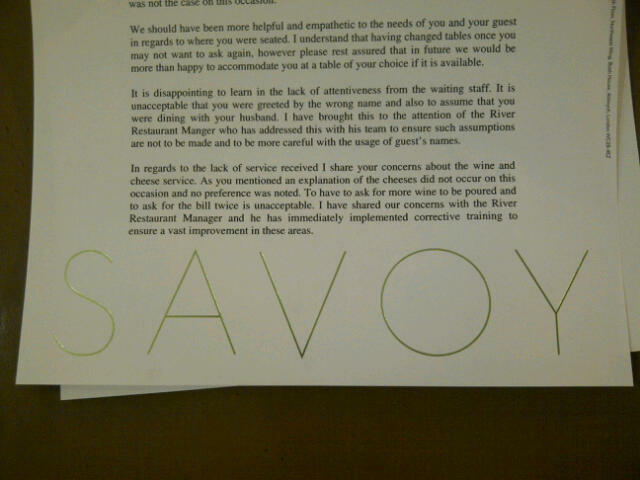 Well, you saw from my last post that I wasn’t happy with the Savoy. They have responded with a very decent letter, acknowledging that the service was not what it should have been – no excuses – a requesting that I return for another visit to see how it is normally done. So I will. And I will report back. I can’t imagine that they can go from zero to hero in one dinner but I wil keep an open mind- as ever. Now, who shall I take with me?